It's no secret that Asia has become well known as a "Land of Opportunity" in almost every business or manufacturing arena. Although a comparatively new venue, pleasure Yacht and Marine related businesses throughout Asia are growing steadily... especially in Taiwan, China, and Thailand. Beautiful coastlines and cruising grounds once dedicated to Military or Commercial use, are being rezoned in many major cities and developing in Grande style, with a view to accommodate even the worlds largest pleasure Yachts. With an ever growing International Market, demanding high quality yachts, and a looming domestic market ramping up and accepting modern western lifestyles, the Yacht business in Asia is well on its way to long term prosperity. If you require or invite business interaction in Asia, the following pages will be of interest. 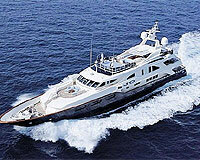 They will assist you in making valuable relationships within the International Yachting Community. if you are interested in any of the opportunities in the following pages. We can provide you with accurate consultation, knowledgeable representation and practical sourcing. Yacht Consultants Asia (HK) Ltd. will act as your agent, if you have a serious interest in a specific listing, or would like to promote a new business venture. Please don't hesitate to email us with the details. As a screening process, we'll read and closely consider all enquiries but reserve the right to refuse interaction without rebuttal. Our role as agent in the promotion of your business opportunity will include any one or all of the following activities. All contact information will be kept strictly confidential until we review the recipient and get your ok to proceed with an introduction. Please contact us for further information regarding fees for consultation, representation, sourcing.